Bike was locked in personal storage space. There is a common outer door, each space has own lock. Locks were not broken. 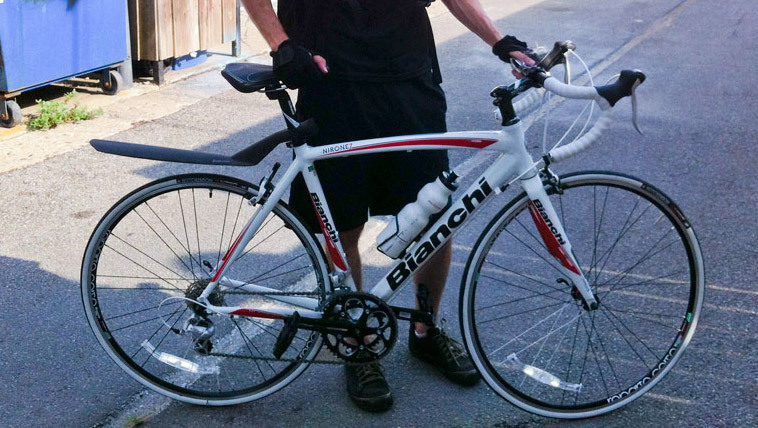 On March 22 2014, the owner reported that he has this bike back: I had been following the Bianchi on Facebook through the profile of the kid who bought it on Facebook. The day the bikes were stolen, the Bianchi buyer updated his cover photo on Facebook with a picture of the bike. So from there, I just followed him on the various known thief facebook groups. He posted in January or February on one of the bike pages looking for parts. I had gotten into a crash in November so the bike was ridable, but in bad shape (wheels, derailleur hanger was bent). Then on this Monday, he posted again he wanted to sell it. I had a friend of mine haggle with him about a price for the bike and they set up a meeting time. From there, I worked with CPD to set up the sting. Today we went over to the police station in my neighborhood and met with the tactical team. They brought about 8 officers out to surround the meet up place (a Walgreens on the corner of Irving and Kedzie). We had my friend who had made the deal wait, while I and another friend stayed out of view. When the kid rode up on my bike, I rode in quickly, grabbed the bike and looked for a serial number (which he removed...but not several other identifying marks). Officers swooped in immediately and took him into custody. I believe the first thing he said was "I didn't steal the bike, but I can tell you who I bought if from." He knew it was stolen. He eventually admitted to seeing it on the registry and did nothing about it.